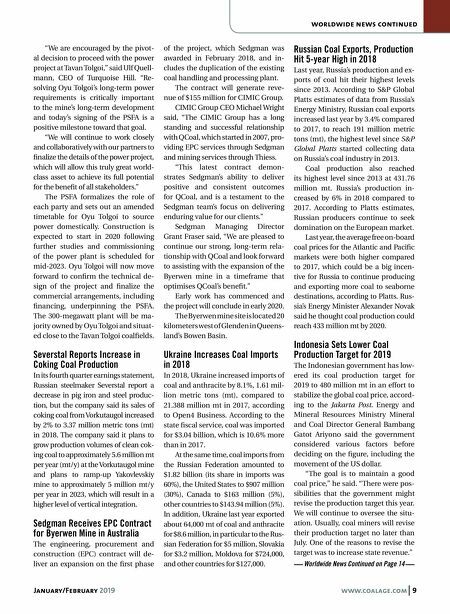 8 www.coalage.com January/February 2019 worldwide news Queensland Coal Exports Hit Record High Queensland's coal exports have reached a record high and yearly totals are predicted to continue growing, ac- cording to the Queensland Resources Council (QRC). The council said 223 million metric tons (mt) of coal was shipped from Queensland ports to 30 different countries and territories last year, trumping the previous record set in 2016 by 2 million mt. 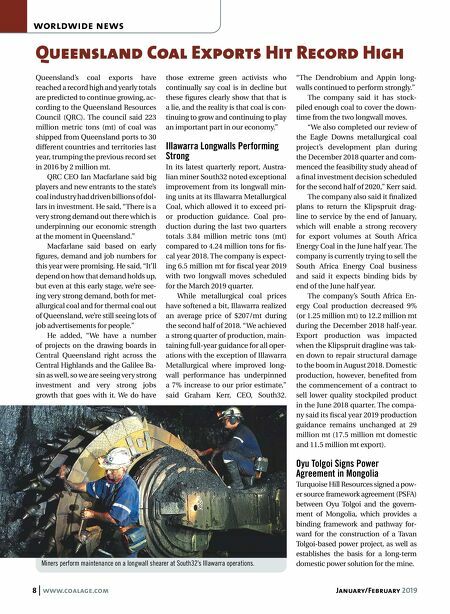 QRC CEO Ian Macfarlane said big players and new entrants to the state's coal industry had driven billions of dol- lars in investment. He said, "There is a very strong demand out there which is underpinning our economic strength at the moment in Queensland." Macfarlane said based on early figures, demand and job numbers for this year were promising. He said, "It'll depend on how that demand holds up, but even at this early stage, we're see- ing very strong demand, both for met- allurgical coal and for thermal coal out of Queensland, we're still seeing lots of job advertisements for people." He added, "We have a number of projects on the drawing boards in Central Queensland right across the Central Highlands and the Galilee Ba- sin as well, so we are seeing very strong investment and very strong jobs growth that goes with it. We do have those extreme green activists who continually say coal is in decline but these figures clearly show that that is a lie, and the reality is that coal is con- tinuing to grow and continuing to play an important part in our economy." Illawarra Longwalls Performing Strong In its latest quarterly report, Austra- lian miner South32 noted exceptional improvement from its longwall min- ing units at its Illawarra Metallurgical Coal, which allowed it to exceed pri- or production guidance. Coal pro- duction during the last two quarters totals 3.84 million metric tons (mt) compared to 4.24 million tons for fis- cal year 2018. The company is expect- ing 6.5 million mt for fiscal year 2019 with two longwall moves scheduled for the March 2019 quarter. While metallurgical coal prices have softened a bit, Illawarra realized an average price of $207/mt during the second half of 2018. "We achieved a strong quarter of production, main- taining full-year guidance for all oper- ations with the exception of Illawarra Metallurgical where improved long- wall performance has underpinned a 7% increase to our prior estimate," said Graham Kerr, CEO, South32. "The Dendrobium and Appin long- walls continued to perform strongly." The company said it has stock- piled enough coal to cover the down- time from the two longwall moves. "We also completed our review of the Eagle Downs metallurgical coal project's development plan during the December 2018 quarter and com- menced the feasibility study ahead of a final investment decision scheduled for the second half of 2020," Kerr said. The company also said it finalized plans to return the Klipspruit drag- line to service by the end of January, which will enable a strong recovery for export volumes at South Africa Energy Coal in the June half year. The company is currently trying to sell the South Africa Energy Coal business and said it expects binding bids by end of the June half year. The company's South Africa En- ergy Coal production decreased 9% (or 1.25 million mt) to 12.2 million mt during the December 2018 half-year. Export production was impacted when the Klipspruit dragline was tak- en down to repair structural damage to the boom in August 2018. Domestic production, however, benefited from the commencement of a contract to sell lower quality stockpiled product in the June 2018 quarter. The compa- ny said its fiscal year 2019 production guidance remains unchanged at 29 million mt (17.5 million mt domestic and 11.5 million mt export). Oyu Tolgoi Signs Power Agreement in Mongolia Turquoise Hill Resources signed a pow- er source framework agreement (PSFA) between Oyu Tolgoi and the govern- ment of Mongolia, which provides a binding framework and pathway for- ward for the construction of a Tavan Tolgoi-based power project, as well as establishes the basis for a long-term domestic power solution for the mine. Miners perform maintenance on a longwall shearer at South32's Illawarra operations.